Try these questions to get to know people. Often, this is because they simply don't know what to say. After all, approaching a stranger you know nothing about can be pretty intimidating -- what in the world do you talk about? Well, the next time you find yourself wondering this at an industry mixer, don't fret. We talked to a handful of career experts to get their recommendations on great questions to ask while networking. Use any of these questions for a quick and painless conversation starter. 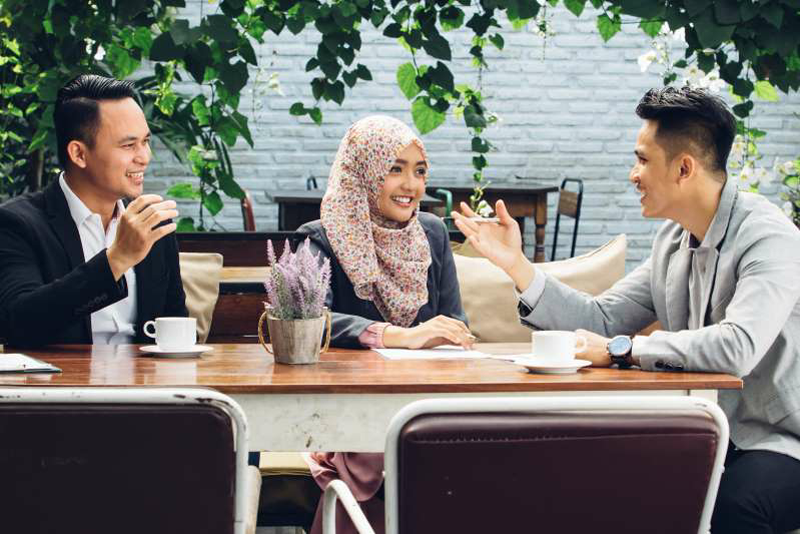 This light-touch question is a great way to begin a conversation, explains Michelle Tillis Lederman, author of The Connector's Advantage: 7 Mindsets to Grow Your Influence and Impact. "This question shows you are interested in the other person and are not just trying to figure out how they can help you. Their response will give you a sense of what they are working on and what is on the front of their mind. That will lead you to extend the conversation and figure out how you can add value to them," Tillis Lederman explains. "They will also likely ask you the question in return and give you an opening to share what your current objectives are." 2. How did you get involved in the industry/company? Once you know a little bit more about somebody's professional background, ask them how they got their start. It can provide valuable takeaways for you, as well as make you seem more likable. "Finding out more about their journey leading up to their current role can offer an excellent insight into what you might need to do in order to work in that industry, role or company," says Lars Herrem, group executive director at recruiting agency Nigel Wright Group. "Demonstrating your interest and enthusiasm is key to creating a lasting impression and making yourself memorable, something which will prove extremely beneficial if you end up reaching out to this person in the future." 3. Since you work in the industry, how do you feel about X? Asking about a specific, timely event in the industry -- whether it's proposed legislation, a merger, a recent news story, etc. -- is a great way to show the person you're speaking with that you are knowledgeable and thoughtful, both of which are key to being memorable, says career coach Eli Howayeck of Crafted Career Concepts. "First impressions matter. The best thing you can do, besides being a nice person, is to demonstrate how you think and what you know about the marketplace," Howayeck explains. "This helps direct the conversation and informs your conversation partner that you likely know what you're talking about or, at a minimum, pay attention to what is going on in the world and [are] not only focused on yourself and your advancement." 4. How would someone get their foot in the door in your company/industry? The ultimate objective of networking is often to get a new job, but coming out and asking somebody you just met to help you get one can be pretty off-putting. However, that doesn't mean you can't approach the topic at all -- you just have to do so delicately. This question "is a subtle way to ask about opportunities without coming right out and saying, 'Do you know if they are hiring?'" says career coach Madelyn Mackie. "If you are lucky, they will ask you if you are interested and then provide you with a business card to follow up with them after the event." Even if they aren't able to help you out directly, though, you will likely gain some valuable insight that will help you in your job search process. 5. Based on your journey, what do you wish someone would have told you earlier in your career? This is a great question to ask if you're speaking with somebody who is more senior than you are. It allows them to impart the knowledge they've acquired over the years with you, as well as appeals to their ego. "People are way more comfortable sharing their wisdom than they are sharing their contacts, and both can be very valuable," Howayeck says. "Seeking to learn from others honors them and shows that you're invested in growth. It also shows deference and can endear the person to you and deepen the connection." 6. How do you spend your time outside of work? At its heart, networking is all about forming connections with others, so don't be afraid to veer toward lighthearted chitchat. Questions like this one help people open up, and make it clear that you don't expect the interaction to be purely transactional. "This kind of question lowers the stakes and also gives the other person a chance to discuss what they're passionate about," Howayeck explains. "It also shows that you are actually interested in them as a person, and not just what they do and how it could help you." 7. What's the best way for me to get in touch/follow up with you? Ask this question, and you're guaranteed to avoid one of the biggest mistakes that novice networkers make, according to career coach Nikki Bruno: "Beginning networkers often make the mistake of giving away a stack of business cards but gathering none. The only way to ensure that you'll be able to follow up with new contacts is to get their information; it keeps you in the driver's seat." "Note that this question is intentionally different from 'May I have your card?'" Bruno adds. "Asking to stay in touch or to follow someone shows that you view him/her as a human being, not as a mere contact."